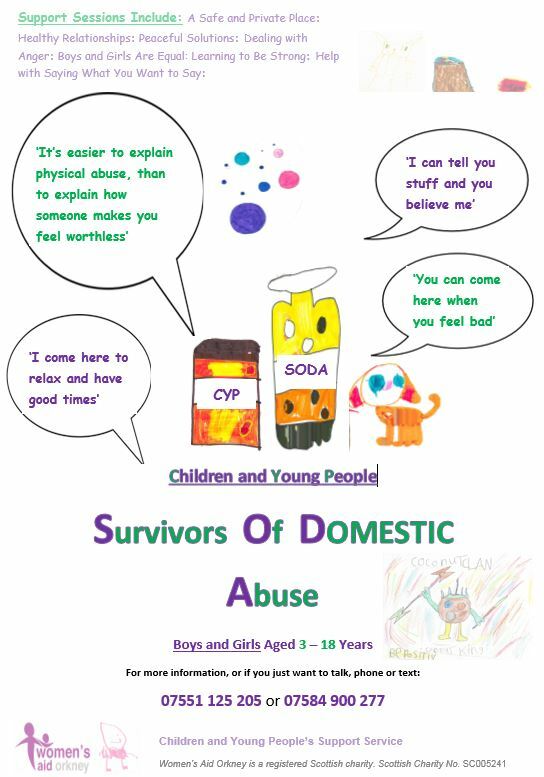 At Women’s Aid Orkney we recognise that boys and girls are also affected by the harms of domestic abuse. That’s why we are helping children and young people too. Offering to help children and young people is a very important part of our work. If you are a young person and want to find out more, have a look at the Children and Young People section of our website. There, you can find out how to contact us, and hear from some of the young people we support. The effects of domestic abuse can cause stress and upset. Add that to the normal pressures of growing up, like friends, exams, relationships, school and many other situations and it can be quite overwhelming. It is normal to feel that there is no one to share concerns or problems with because of everything that is going on at home. What can Women’s Aid Orkney do to help Children and Young People? listening to children and believing them. organising outings and activities with other young people in similar situations e.g swimming, watching a movie, playing games or working on projects. Support is available to all children aged 3-18 who have been affected by domestic abuse. If you think your children could benefit from specialist support, contact us, or speak to your support worker.